Today, Microsoft has announed that their Build conferences for 2014 will be held at the Moscone Center in San Francisco, CA on April 2nd through the 4th. 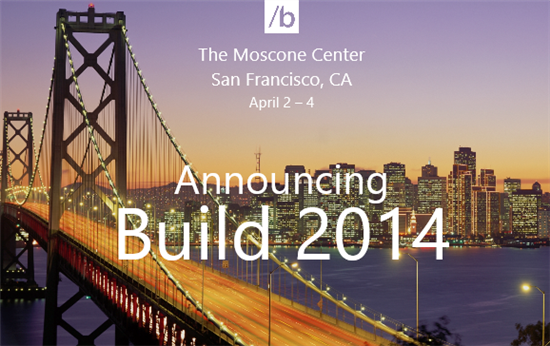 The momentum just keeps building and that is why I’m so excited to announce our next developer conference, Build 2014, which will take place April 2 to April 4 at the Moscone Center in San Francisco. Save the date and mark your calendar for registration, which opens at 9 a.m. PT on Jan. 14 at www.buildwindows.com. As always, Build is a time to bring developers together to talk about our latest products, platform advances, tools and offerings, all of which come together to create unmatched apps and scenarios. With Windows, developers can create new experiences to reach hundreds of millions of devices on peoples’ desks, in their homes, in their pockets and in their living rooms. At this year’s event, we’ll talk about what’s next for Windows, Windows Phone, Windows Azure, Windows Server, Visual Studio and much more. So pay a visit to www.buildwindows.com, plan to register on Jan. 14, and join us for three days of immersive presentations delivered by the engineers behind our devices and services. Be among the first to see what’s next from Microsoft. We’ll look forward to seeing you at Moscone! Written by: Hyde13 on December 13, 2013.